Each of us presents ourselves in one way or another on a regular basis; sharing who you are and what you do, interviewing for a new job or presenting a PowerPoint presentation to a potential client, or speaking to your supervisor or board. All of these are great opportunities to shine and catapult your career or business. The key is to make sure that you're ready to use each opportunity to the fullest and win over your audience. Here are seven simple speaking strategies that will allow you to stand out when you're speaking to a professional audience. Walking in the audience will help you to not only retain their attention but it will also allow for a closer connection, making them feel like you're one of them. Be sure you are addressing a specific problem or challenge that your audience most likely is currently experiencing or has faced before. Then, be sure to offer a solution to that problem or challenge during your presentation. Give them actionable steps that they can use and implement right away. Also, make sure that you have a clear call to action -- what action should they take moving forward if they are ready to take the next step? The delivery of your message is very important. No one wants to listen to a stiff or monotone person. Attempt to have a pleasant vocal quality. There are four main areas to focus on this throughout your presentation: vary the tone of your voice, vary your volume, vary the speed at which you talk, and learn to pause when appropriate to create greater impact. Avoid distracting habits. A habit will often distract the audience from focusing on your message. The best way that I have found to identify if you have any distracting habits, is to either practice your presentation in front of a friend or family member and have them share any constructive feedback, or you can videotape your-self and watch it. By catching yourself in a bad habit or at least being aware of what you're doing you can learn to break the habit. Do you look like a leader that others will want to follow? Does your attire make you feel confident about yourself? Be sure to wear clothing that is appropriate to the industry culture you are presenting to. Avoid sharing the same stories over and over again, mix it up or put a different spin or twist on it. A powerful tool is weaving current events into your presentation when possible -- perhaps something that happened that day or week might reinforce the reason for the discussion. Make sure that you modify your presentation to appeal to your specific audience. Another way to keep it fresh is to mention the latest trends in your industry or even in pop culture this will help to keep your audience engaged. Rehearse your presentation! Reviewing your notes, will not cut it! 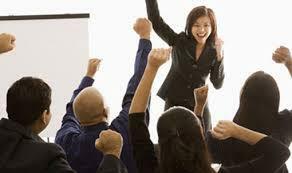 In order to be a great speaker, you must know your presentation inside and out backwards and forwards. You must know exactly how you will start, what questions you will ask, what stories or case studies you will be sharing, when you will vary your tone and volume, where to look and when and finally what your call to action is. Rehearsing will help you look and sound more polished and most importantly allow you to feel more confident. These strategies will allow you to engage and win over any audience. Go out there and shine like the star you are!